To discuss the challenges faced by the medical community in identifying and managing patients with COPD, and to brainstorm potential strategies to improve the diagnosis and treatment of COPD, an advisory group of respiratory specialists and payer stakeholders was convened on November 14, 2015, in Hoboken, NJ. The panel of experts included practicing pulmonologists with extensive research backgrounds, as well as medical and pharmacy directors from the payer side who represented the population-based value perspective. The advisory panel was assembled to develop actionable strategic and tactical recommendations for all healthcare system stakeholders committed to delivering high-quality care for patients with COPD. To that end, the sponsor of the panel discussion sought to identify reasons for variation in the care of patients with COPD, discuss avenues for providers and payers to align on system-wide opportunities for care improvement, and share best practices with stakeholders so that they can consider them when developing optimal COPD management strategies. This advisory panel reviewed the current standards of COPD care based on clinical guidelines and recent emerging data, and discussed the central role of pharmacotherapy in minimizing the frequency and the severity of acute COPD exacerbations. Looking forward, the panel discussed the research that will be needed to generate evidence required to support ongoing clinical innovation and value-driven care for patients with COPD. Within this context, the group also discussed the role of nebulized therapy for the treatment of patients with COPD in a value-based care paradigm, particularly with respect to clinical outcomes and patient adherence to therapy. Genetics, particularly alpha-1 antitrypsin deficiency, although other genetic factors are thought to make smokers more susceptible to COPD. The clinicians and payers participating on the advisory panel identified that COPD guidelines, particularly the earlier version of the GOLD guidelines, may not provide sufficiently clear, unequivocal guidance for the management of COPD, especially for primary care providers. This may be attributed in part to the lack of objective disease markers in COPD (such as glycated hemoglobin A1c levels in diabetes or lipid levels in dyslipidemia), which complicates the patient assessment process in COPD. In addition, one pulmonologist participating on the panel pointed out that the sheer length of the GOLD guidelines made it impractical for practicing physicians to use as a reference. According to the GOLD guidelines, spirometry is required to make a confident diagnosis of COPD when COPD is suspected because of symptoms; a family history of COPD or other chronic respiratory pattern; and/or a history of hazardous exposures, such as tobacco smoke, occupational dusts, or fumes. The presence of a postbronchodilator FEV1/forced vital capacity <0.70 may be indicative of persistent airflow limitation and, therefore, of COPD.7 At the extremes of age, use of the lower limit of normal for FEV1/FVC is a more reliable indicator of airflow obstruction. Participating pulmonologists indicated that although symptom-based assessment is important, current assessment tools available to the medical community have limited utility, noting that these assessment tools are not always reflective of patients’ real-world experiences and needs. Choose the highest risk according to the GOLD grade or medical history. Payers and providers participating in the panel agreed that it is critical for systems of care to develop processes that facilitate the early diagnosis and treatment of COPD, noting that screening programs that identify less advanced disease, and timely, aggressive treatment have been shown to yield improved outcomes. Integrated health systems appear to be well-positioned to implement a holistic, coordinated approach to care. The panel agreed that improper inhaler technique remains an issue for many patients, despite training and retraining efforts. One participant noted that studies evaluating the impact of suboptimal device utilization on health outcomes are needed to better understand the scope of the problem and to formulate potential solutions. Participating panel clinicians support the use of nebulized maintenance therapy with long-acting agents for appropriate patients, agreeing that maintenance treatment with long-acting nebulizers may lead to the reduced use of short-acting bronchodilators. The participating panel members agreed that, in some situations, the criteria guiding the decision to recommend nebulized therapy were relatively straightforward, particularly in patients discharged from hospitals after an inpatient stay; in patients demonstrating consistent difficulty using inhalers, even after training; and in patients with impaired manual dexterity, chronic muscle weakness, or cognitive impairment. Overall, the participating clinicians indicated that they were more likely to recommend nebulized therapy for older patients with more severe disease. In the absence of more evidence, several participating clinicians agreed that patient preference will continue to be a major factor in decisions regarding delivery methods. In addition to novel agents, participating panel clinicians and payers anticipate the approval of new generic entries, although some voiced concerns about the potential overuse of generic fluticasone propionate/salmeterol for the short-term relief of COPD. With numerous generic drugs already available and others poised to enter the market, participants anticipate “an era of therapeutic substitution” in COPD; participating clinicians did not voice strong objections to therapeutic substitution, as long as it is clinically appropriate. The advisory panel participants echoed these perceptions, underlining that shortcomings in the primary care of patients with COPD are caused by a lack of awareness and knowledge about the disease, lack of confidence in the use of spirometry to assess patients’ airflow limitation, and the perception that current therapeutic options have limited effectiveness. As primary care delivery has evolved, there has been a greater emphasis on primary prevention and coordinated care delivery. To aid in the prevention of COPD, the advisory panel participants agreed that the primary care team should actively counsel patients to stop smoking, regardless of patients’ spirometry results. In addition, providers indicated that COPD disease education could help to encourage patients to discuss their symptoms with their primary care providers and thereby facilitate the earlier identification of COPD. Despite efforts to improve care delivery, several participants noted that barriers to patient access continued to hinder the ability of primary care providers and specialists to provide optimal care. For example, many patients are from underserved populations and may be difficult to reach. For individuals with financial, transportation, or cultural barriers, it can be a huge challenge to continue smoking cessation efforts, attend regular office visits, and remain adherent to COPD maintenance treatment. With regard to nebulized therapy, the panel members agreed that it is essential that pharmacists understand the dispensing and reimbursement mechanisms for a product that has both pharmacy and durable medical equipment (DME) components. With nebulized therapy, this may be a challenge for patients and providers, because the drug may be covered under the pharmacy benefit, and the device may be covered as a DME under the medical benefit. At the point of dispensing, pharmacists would benefit from a deeper understanding of how this dynamic may affect drug and DME acquisition and cost-sharing for patients. In turn, they would be better equipped to counsel patients regarding these challenges. The panel payers agreed that the hospitalization costs were the primary driver of COPD costs at their respective health plans, and the panel pulmonologists recognized the importance of reducing acute exacerbations of COPD, because they often result in hospitalizations. “The entire medical community needs to start thinking about exacerbation frequency in COPD because that’s where 50% to 75% of the cost is,” stated one panel pulmonologist. For this reason, many payers have instituted aggressive care management programs in an effort to reduce inpatient admissions for COPD. Participating panel payers noted that they identify high-risk patients with COPD through their claims data, ICD-10 (International Classification of Diseases, Tenth Revision) diagnosis codes, and National Drug Codes, and may assign patients to a case manager to follow up with members and monitor their medication utilization and adherence. The participating panel payers are continuing their efforts to integrate medical and pharmacy data, which improves their ability to evaluate utilization patterns, assess outcomes, and tailor interventions to member subpopulations. One panel participant noted that in COPD, some readmissions occurring outside of the 30-day window may be related to the index admission. In integrated health systems, the payer side may benefit from the reduced hospital readmissions, but that may be offset by penalties on the hospital side. Because of the focus on acute exacerbations of COPD and resulting hospitalizations, the participating panel payers indicated that they offer relatively open access to COPD therapies (monotherapy and combination), with few restrictions, albeit members may have higher copayments for nonpreferred drugs. Preferred status is typically determined by contracts negotiated with manufacturers, either by the health plan or by the pharmacy benefit manager that manages the health plan’s pharmacy benefit. “It’s very important for us to offer access to COPD drugs. Our typical (monthly) copay is $35 for a preferred product and $50 for a nonpreferred product. I also don’t see any barriers to combination therapies in the near-term,” noted one panel payer. The participating panel payers indicated that as with inhaled agents, they do not place restrictions on nebulized therapies. One participating medical director noted that nebulizers were relatively inexpensive compared with the cost of many other drugs; therefore, there was no compelling reason for his organization to restrict their availability. However, another participant added that his plan may restrict the approval of more than 1 nebulizer for the same drug within a 12-month period. During the panel discussion, it was also noted that the Centers for Medicare & Medicaid Services does not have a national coverage policy regarding nebulizers; the decision is left to regional Medicare Administrative Contractors. In terms of nebulizer utilization, the participating clinicians and payers agreed that the ideal nebulizer should be versatile, with the ability to accommodate as many drugs as possible. One payer noted that the development of nebulizers with multidrug capacity would likely stimulate increased utilization. In the future, clinicians and payers seek outcomes data to differentiate long-acting therapies, including nebulization, for the treatment of COPD. The key outcome metrics of interest to the group included the hospital length of stay, readmission rates, intensive care unit utilization, overall cost of care, and patient satisfaction. These themes extended to the nebulized therapy formoterol fumarate, and participating clinicians and payers both expressed their desire for more outcomes-related end points in clinical trials. However, the panel participants also acknowledged that the clinical trial design was critical, because the number of patients required to sufficiently power some studies may be impractical and cost-prohibitive. In general, payers defer to pulmonary specialists’ recommendations and do not actively manage utilization of drugs or delivery devices in the COPD category. COPD is underdiagnosed and undertreated. A low awareness of COPD and the initial symptoms of the disease among the general population, acceptance of these symptoms as a consequence of aging or smoking, clinical similarities to asthma, and failure of healthcare providers to use spirometry to guide COPD diagnosis all contribute to its suboptimal identification and treatment. In addition, challenges exist in managing patients diagnosed with the disease, and reducing the burden of COPD will require improved management of chronic symptoms. Acute exacerbations and hospitalizations are the primary driver of cost and morbidity in COPD; therefore, high priority should be given to interventions aimed at delaying the progression of disease, preventing exacerbations, and reducing the risk for comorbidities to alleviate the clinical and economic burden of COPD. Short- and long-acting bronchodilators remain the mainstays of pharmacologic treatment for COPD. Bronchodilators are most frequently given in an inhaled form using an MDI, DPI, or a nebulizer. Although current guidelines recommend inhalation therapy as the preferred route of drug administration for treating COPD, inhaler misuse remains a common problem in clinical practice, limiting its effectiveness and resulting in the suboptimal symptom relief for patients with COPD. Evidence suggests that nebulizer use for maintenance therapy in patients with moderate-to-severe COPD, including use during exacerbations, is comparable, and, in some respects superior, to the efficacy provided by MDIs and DPIs. In fact, nebulized therapy may be preferred in elderly patients, those with severe disease and frequent exacerbations, and those with physical and/or cognitive limitations. In an advisory meeting that included practicing pul­monologists and representatives from payer organizations, there was considerable agreement regarding the importance of specialty care in COPD; maintaining open access to pharmacologic therapy; and the need for redoubled focus on reducing acute exacerbations, hospital admissions, and hospital readmissions associated with COPD. Because payers do not want to hinder the effective management and control of COPD, they do not restrict access to specific short- and long-acting therapies. Participating pulmonologists recognized the value of nebulized therapy, but maintained that a good understanding of the patient clinical presentation and life circumstances were necessary to make informed treatment recommendations. In addition, they agreed that better clinical markers are needed to identify optimal candidates for nebulized therapy. In terms of unmet pharmacologic needs, participating pulmonologists noted that a nebulized LAMA option would likely increase the use of combination LABA/LAMA nebulized therapy. Both pulmonologists and payers voiced the need for clinical studies to include outcomes measures to help clinicians make better informed decisions about therapeutic selection. Dr Ohar is on the advisory board for AstraZeneca, Boehringer Ingelheim, CSL Behring, Mylan, Novartis, and Sunovion, and is a consultant to Theravance. Dr Schaecher reported no conflicts of interest. 1. American Lung Association. Trends in COPD (chronic bronchitis and emphysema): morbidity and mortality. March 2013. www.lung.org/assets/documents/research/copd-trend-report.pdf. Accessed December 29, 2015. 2. Centers for Disease Control and Prevention. Trends in current cigarette smoking among high school students and adults, United States, 1965–2011. www.cdc.gov/tobacco/data_statistics/tables/trends/cig_smoking/. Accessed February 1, 2016. 3. Bellamy D, Smith J. Role of primary care in early diagnosis and effective management of COPD. Int J Clin Pract. 2007;61:1380-1389. 4. Halpin DMG, Miravitlles M. Chronic obstructive pulmonary disease: the disease and its burden to society. Proc Am Thorac Soc. 2006;3:619-623. 5. Centers for Disease Control and Prevention. Chronic obstructive pulmonary disease (COPD). Updated March 12, 2015. www.cdc.gov/copd/index.html. Accessed December 28, 2015. 6. COPD Foundation. What is COPD? www.copdfoundation.org/What-is-COPD/Understanding-COPD/What-is-COPD.aspx. Accessed December 28, 2015. 7. Global Initiative for Chronic Obstructive Lung Disease. Global strategy for the diagnosis, management, and prevention of chronic obstructive pulmonary disease. Updated 2015. www.goldcopd.org/uploads/users/files/GOLD_Report_2015.pdf. Accessed December 29, 2015. 8. Mayo Clinic staff. Diseases and conditions: COPD: risk factors. July 21, 2015. www.mayoclinic.org/diseases-conditions/copd/basics/risk-factors/con-20032017. Accessed December 28, 2015. 9. Cavaillès A, Brinchault-Rabin G, Dixmier A, et al. Comorbidities of COPD. Eur Respir Rev. 2013;22:454-475. 10. Shen T-C, Lin C-L, Chen C-H, et al. Increased risk of chronic obstructive pulmonary disease in patients with rheumatoid arthritis: a population-based cohort study. QJM. 2014;107:537-543. 11. American Lung Association. How serious is COPD. www.lung.org/lung-health-and-diseases/lung-disease-lookup/copd/learn-about-copd/how-serious-is-copd.html. Accessed December 28, 2015. 12. Mannino DM, Gagnon RC, Petty TL, Lydick E. Obstructive lung disease and low lung function in adults in the United States: data from the National Health and Nutrition Examination Survey 1988-1994. Arch Intern Med. 2000;160:1683-1689. 13. Centers for Disease Control and Prevention. Increase expected in medical care costs for COPD. Updated July 29, 2014. www.cdc.gov/features/ds-copd-costs/. Accessed December 28, 2015. 14. Ford ES, Murphy LB, Khavjou O, et al. Total and state-specific medical and absenteeism costs of COPD among adults aged ≥18 years in the United States for 2010 and projections through 2020. Chest. 2015;147:31-45. 15. Elixhauser A, Au DH, Podulka J. Readmissions for chronic obstructive pulmonary disease, 2008. Statistical brief #121. September 2011. Agency for Healthcare Research and Quality, Rockville, MD. www.hcup-us.ahrq.gov/reports/statbriefs/sb121.jsp. Accessed December 28, 2015. 16. Kanel K, Elster S, Vrbin C. PRHI Readmission Briefs: Brief I: overview of six target chronic diseases. March 2010. www.prhi.org/documents/PRHIReadmissionsBriefOverviewofSixTargetChronicDiseases.pdf. Accessed March 4, 2016. 17. Qaseem A, Wilt TJ, Weinberger SE, et al; for the American College of Physicians; American College of Chest Physicians; American Thoracic Society; European Respiratory Society. Diagnosis and management of stable chronic obstructive pulmonary disease: a clinical practice guideline update from the American College of Physicians, American College of Chest Physicians, American Thoracic Society, and European Respiratory Society. Ann Intern Med. 2011;155:179-191. 18. National Clinical Guideline Centre–Acute and Chronic Conditions. Chronic obstructive pulmonary disease: management of chronic obstructive pulmonary disease in adults in primary and secondary care: update guideline. 2010. www.nice.org.uk/guidance/cg101/chapter/4-Research-recommendations. Accessed December 30, 2015. 19. Gruffydd-Jones K, Loveridge C. The 2010 NICE COPD Guidelines: how do they compare with the GOLD guidelines? Prim Care Respir J. 2011;20:199-204. 20. Fromer L. Diagnosing and treating COPD: understanding the challenges and finding solutions. Int J Gen Med. 2011;4:729-739. 21. van der Molen T, Willemse BW, Schokker S, et al. Development, validity and responsiveness of the Clinical COPD Questionnaire. Health Qual Life Outcomes. 2003;1:13. 22. CCQ Clinical COPD Questionnaire. www.ccq.nl/. Accessed January 12, 2016. 23. American Thoracic Society. COPD Assessment Test (CAT). www.thoracic.org/members/assemblies/assemblies/srn/questionaires/copd.php. Accessed January 5, 2016. 24. American Thoracic Society. Clinical assessment testing and differential diagnosis: clinical assessment. www.thoracic.org/copd-guidelines/for-health-professionals/clinical-assessment-testing-and-differential-diagnosis/clinical-assessment.php. Accessed January 5, 2016. 25. Mayo Clinic staff. Diseases and conditions: COPD: treatments and drugs. July 21, 2015. www.mayoclinic.org/diseases-conditions/copd/basics/treatment/con-20032017. Accessed December 28, 2015. 26. US Food and Drug Administration. 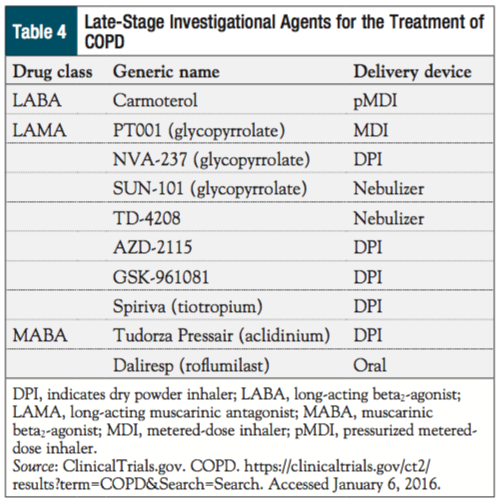 Drug treatments for asthma and chronic obstructive pulmonary disease that do not use chlorofluorocarbons. Updated April 8, 2015. www.fda.gov/Drugs/DrugSafety/InformationbyDrugClass/ucm082370.htm. Accessed January 6, 2016. 27. Buddiga P; for Medscape. Use of metered dose inhalers, spacers, and nebulizers. Updated December 9, 2015. http://emedicine.medscape.com/article/1413366-overview#showall. Accessed January 5, 2016. 28. Dolovich MB, Ahrens RC, Hess DR, et al; for the American College of Chest Physicians; American College of Asthma, Allergy, and Immunology. Device selection and outcomes of aerosol therapy: evidence-based guidelines: American College of Chest Physicians/American College of Asthma, Allergy, and Immunology. Chest. 2005;127:335-371. 29. Spiriva Respimat (tiotropium bromide) inhalation spray [prescribing information]. Ridgefield, CT: Boehringer Ingelheim Pharmaceuticals, Inc; September 2015. 30. Newman SP, Brown J, Steed KP, et al. Lung deposition of fenoterol and fluniso­lide delivered using a novel device for inhaled medicines: comparison of RESPIMAT with conventional metered-dose inhalers with and without spacer devices. Chest. 1998;113:957-963. 31. Newman SP. Inhaler treatment options in COPD. Eur Respir Rev. 2005;14:102-108. 32. Quinet P, Young CA, Héritier F. The use of dry powder inhaler devices by elderly patients suffering from chronic obstructive pulmonary disease. Ann Phys Rehabil Med. 2010;53:69-76. 33. Taffet GE, Donohue JF, Altman PR. Considerations for managing chronic obstructive pulmonary disease in the elderly. Clin Interv Aging. 2014;9:23-30. 34. Melani AS, Bonavia M, Cilenti V, et al. Inhaler mishandling remains common in real life and is associated with reduced disease control. Respir Med. 2011;105:930-938. Erratum in: Respir Med. 2012;106:757. 35. Molimard M, Raherison C, Lignot S, et al. Assessment of handling of inhaler devices in real life: an observational study in 3811 patients in primary care. J Aerosol Med. 2003;16:249-254. 36. Souza ML, Meneghini AC, Ferraz E, et al. Knowledge of and technique for using inhalation devices among asthma patients and COPD patients. J Bras Pneumol. 2009;35:824-831. 37. Dhand R, Dolovich M, Chipps B, et al. The role of nebulized therapy in the management of COPD: evidence and recommendations. COPD. 2012;9:58-72. 38. Geller DE. Comparing clinical features of the nebulizer, metered-dose inhaler, and dry powder inhaler. Respir Care. 2005;50:1313-1321; discussion 1321-1322. 39. Okapo SO, Gupta J, Martinez E, Roach M. In vitro deposition properties of nebulized formoterol fumarate: effect of nebulization time, airflow, volume of fill and nebulizer type. Curr Med Res Opin. 2009;25:807-816. 40. Rau JL, Restrepo RD. 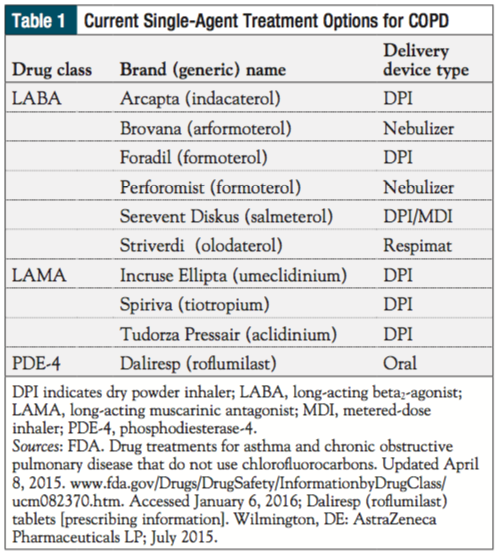 Nebulized bronchodilator formulations: unit-dose or multi-dose? Respir Care. 2003;48:926-939. 41. American Medical Directors Association. COPD Management in the Long-Term Care Setting: Clinical Practice Guideline. Columbia, MD: American Medical Directors Association; 2010. 42. Sharafkhaneh A, Wolf RA, Goodnight S, et al. Perceptions and attitudes toward the use of nebulized therapy for COPD: patient and caregiver perspectives. COPD. 2013;10:482-492. 43. Ari A. Jet, ultrasonic, and mesh nebulizers: an evaluation of nebulizers for better clinical outcomes. Eurasian J Pulmonol. 2014;16:1-7. 44. Perforomist (formoterol fumarate) inhalation solution [prescribing information]. Morgantown, WV: Mylan Specialty LP; March 2013. 45. Brovana (aformoterol tartrate) inhalation solution [prescribing information]. Marlborough, MA: Sunovion Pharmaceuticals Inc; February 2014. 46. Hou S, Wu J, Li X, Shu H. Practical, regulatory and clinical considerations for development of inhalation drug products. Asian J Pharm Sci. 2015;10:490-500. 47. Gross NJ, Nelson HS, Lapidus RJ, et al; for the Formoterol Study Group. Efficacy and safety of formoterol fumarate delivered by nebulization to COPD patients. Respir Med. 2008;102:189-197. 48. Sunovion Profile. Efficacy. www.sunovionprofile.com/sp/brovana/clinical/efficacy.html. Accessed February 1, 2016. 49. ClinicalTrials.gov. COPD. https://clinicaltrials.gov/ct2/results?term=COPD&Search=Search. Accessed January 6, 2016. 50. ClinicalTrials.gov. TD-4208. https://clinicaltrials.gov/ct2/show/NCT02512510?term=td-4208&rank=5. Accessed January 6, 2016. 51. Theravance Biopharma. Revefenacin (TD-4208). www.theravance.com/respiratory. Accessed January 7, 2016. 52. ClinicalTrials.gov. SUN-101. https://clinicaltrials.gov/ct2/show/NCT02347774?term=sun-101&rank=4. Accessed January 6, 2016. 53. Cazzola M, Lopez-Campos J-L, Puente-Maestu L. The MABA approach: a new option to improve bronchodilator therapy. Eur Respir J. 2013;42:885-887. 54. The Commonwealth Fund. Primary care providers’ views of recent trends in health care delivery and payment. https://kaiserfamilyfoundation.files.wordpress.com/2015/08/1831_commonwealth_kaiser_primary_care_survey_final1.pdf. Accessed January 10, 2016. 55. Greene J. In reform era, retail clinics become part of the healthcare delivery system. www.modernhealthcare.com/article/20131209/INFO/312099991. Accessed January 10, 2016. 56. UnitedHealth Center for Health Reform and Modernization. Advancing primary care delivery: practical, proven, and scalable approaches. www.unitedhealthgroup.com/~/media/UHG/PDF/2014/UNH-Primary-Care-Report-Advancing-Primary-Care-Delivery.ashx. Accessed January 10, 2016. 57. Martinez CH, Mannino DM, Jaimes FA, et al. Undiagnosed obstructive lung disease in the United States: associated factors and long-term mortality. Ann Am Thorac Soc. 2015;12:1788-1795. 58. Foster JA, Yawn BP, Maziar A, et al. Enhancing COPD management in primary care settings. MedGenMed. 2007;9:24. 59. Spyratos D, Chloros D, Sichletidis L. Diagnosis of chronic obstructive pulmonary disease in the primary care setting. Hippokratia. 2012;16:17-22. 60. Joo MJ, Sharp LK, Au DH, et al. Use of spirometry in the diagnosis of COPD: a qualitative study in primary care. COPD. 2013;10:444-449. 61. American Pharmacists Association Foundation. White paper on expanding the role of pharmacists in chronic obstructive pulmonary disease. www.aphafoundation.org/sites/default/files/ckeditor/files/110207JAPhA_COPDWhitePaper.pdf. Accessed January 10, 2016. 62. National Heart, Lung, and Blood Institute. Morbidity and Mortality: 2012 Chart Book on Cardiovascular, Lung and Blood Diseases. 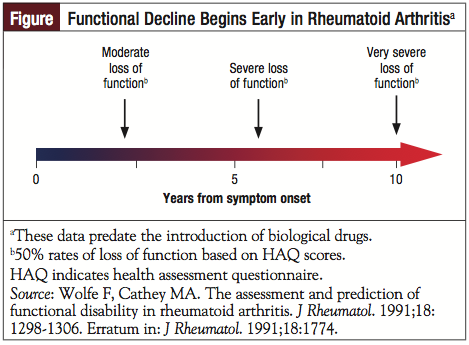 www.nhlbi.nih.gov/files/docs/research/2012_ChartBook_508.pdf. Accessed February 23, 2016. 63. Blanchette CM, Gross NJ, Altman P. Rising costs of COPD and the potential for maintenance therapy to slow the trend. Am Health Drug Benefits. 2014;7:98-106. 64. Guarascio AJ, Ray SM, Finch CK, Self TH. 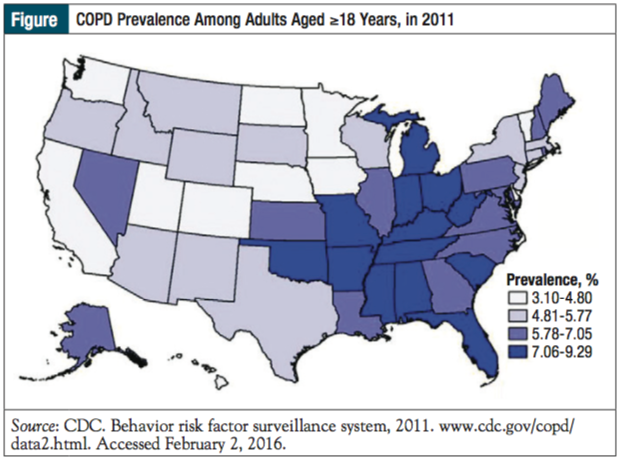 The clinical and economic burden of chronic obstructive pulmonary disease in the USA. ClinicoEconomics Outcomes Res. 2013;5:235-245. 65. Centers for Medicare & Medicaid Services. Readmissions reduction program. www.cms.gov/medicare/medicare-fee-for-service-payment/acuteinpatientpps/readmissions-reduction-program.html. Accessed January 12, 2016. 66. Kaiser Family Foundation. Aiming for fewer hospital U-turns: the Medicare Hospital Readmission Reduction Program. http://kff.org/medicare/issue-brief/aiming-for-fewer-hospital-u-turns-the-medicare-hospital-readmission-reduction-program/. Accessed January 12, 2016. 67. US Department of Health & Human Services. New HHS data shows major strides made in patient safety, leading to improved care and savings. http://innovation.cms.gov/Files/reports/patient-safety-results.pdf. Accessed January 12, 2016.